Release of our 2016 Reserve Chardonnay and 2016 Estate Chardonnay! This month we are very pleased to be releasing two Chardonnay wines from the 2016 vintage – our 2016 limited release Reserve Chardonnay and also our 2016 Estate Chardonnay! 2016 Reserve Chardonnay A gold medal winner at the 2018 Tasmanian Wine Show, also awarded 96 points by wine writer Huon Hooke, who ranked it as the second best Chardonnay from Tasmania in the 2016 vintage (there are 43 wines in this category, so we were very pleased with this result!). This limited release wine shows complex lemon, grapefruit, almond, oatmeal and spicy French oak flavours balanced by crisp, bright acidity. Food matches would include slow cooked Scottsdale pork shoulder. More details of this wine (including the full review from Huon Hooke as well as other accolades) can be found here. 2016 Estate Chardonnay This wine is also a gold medal winner, at the 2017 Australian Cool Climate Wine Show and was also awarded 94 points by Wine Showcase Magazine earlier this year. This premium cool climate Chardonnay showcases a medley of grapefruit, citrus, vanilla and integrated French oak flavours, finishing with intensity and power. You can enjoy this wine now and it will also reward careful cellaring. Food matches would include herb roasted Marion Bay chicken. More details of this wine can be found here. Our 2014 Pinot Noir wines have arrived…. In vintage 2014 we decided, after repeated requests, to make a Reserve Pinot Noir (something that we have continued in subsequent vintages) – it has been a while, the last Reserve Pinot Noir we made was in 2006! The time has now come to release both our Estate Pinot Noir and the Reserve Pinot Noir wines! But we want to make sure that our loyal mailing list members are given priority notification – especially for the 2014 Reserve Pinot Noir, with less than 50 dozen of this rare wine available to purchase. 2014 Estate Pinot Noir: Made in our traditional bold style, this cool climate Pinot Noir has a spicy dark cherry nose and an intense, balanced palate with flavours of dark plums and cherries, savoury spices and subtle French oak. Perfect with roast duck or pork, this wine may be enjoyed now or confidentially cellared. Winner of 4 gold medals, 96 points from James Halliday, 95 points from both Nick Stock and Huon Hooke and more. Full details of the wine and its numerous awards can be found here. 2014 Reserve Pinot Noir: This is a showcase Tasmanian Pinot Noir, selected from the very best parcels of fruit. This is a complex and powerful wine, with flavours of dark cherry and raspberry, spice and French oak flavours and excellent length and balance. This limited release wine can be enjoyed now, but will reward careful cellaring. The small volume made meant that it couldn’t be entered into most wine shows but it has still won 2 gold medals and been described as “A really superb wine” by wine writer Huon Hooke. More details can be found here. It is not always about Pinot Noir….! As many of our loyal mailing list members are aware, we don’t just make Pinot Noir – we also make a Cabernet Merlot – and of course other very enjoyable wines! You can produce excellent Cabernet Merlot wines in Tasmania, but they require the right site as well as meticulous work in the vineyard. We’ve just released our 2013 vintage, and consider it the best Cabernet Sauvignon / Merlot blend we have made to date. 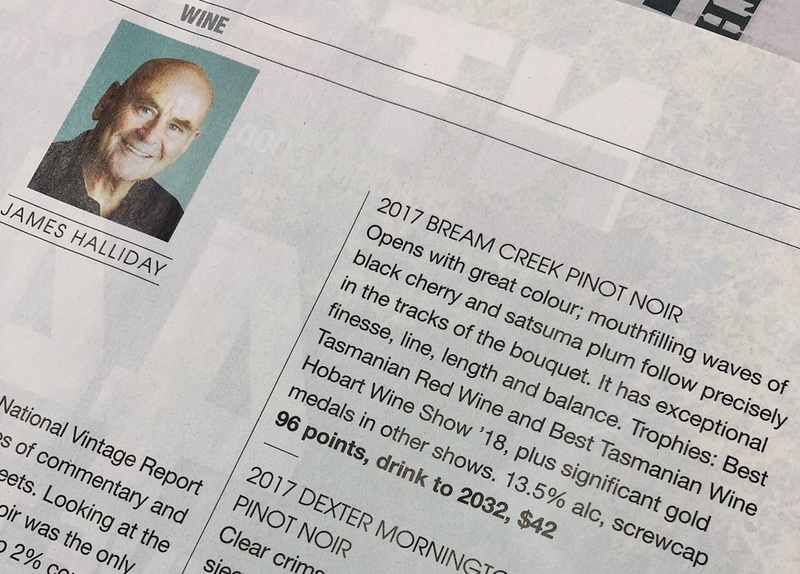 Winestate Magazine agrees, twice rating it at 4.5 stars and top of its category– with the second result being awarded as part of the “Annual Cabernet Challenge 2017”. It is a classically styled cool climate Cabernet Merlot, the nose expressive with blackberries, black cherries and lifted floral notes while the medium bodied palate has blackberry and dark plum flavors intertwined with cocoa, smoky oak and mineral nuances. The excellent tannin structure will ensure this wine develops in the cellar over the next several years – or you could simply drink it right now, paired with a rich meat dish such as Tasmanian Cape Grim beef fillets. This is a wine well suited to winter dining! Interested? You can purchase it here – and if you are a Wine Club member, don’t forget to use your personal code for a discount on our regular price! I am very pleased to announce the release of two new wines. Firstly, our 2008 Cellar Release Pinot Noir. In 2008 we decided to hold back a portion of our award winning Pinot Noir for extended maturation. We are now proud to present the result – a fully mature Pinot Noir at its drinking peak. There are intense notes of black cherries and dark cherries on the nose, while the palate is smooth and deep, rich with dark fruits, spice and forest floor characters. Secondly, we’ve also just released our 2015 Estate Chardonnay. This elegant, cool climate Chardonnay shows flavours of citrus and apple, hazelnuts and a touch of fig, which are supported by creamy nuances from time on lees, fine acidity and well integrated French oak. All three wines can be purchased here – remember that you can mix and match your wines in any multiple of six bottles. Oh, and remember we accept AMEX in addition to Visa, MasterCard and Direct Deposit. Tasmanian Wine Show 2017 Success! We had last released a Reserve Pinot Noir in 2005. However, the quality of the 2014 vintage produced superb wines and some of exemplary quality, deserving of Reserve classification. We expect to release the 2014 Reserve and 2014 Estate Pinot Noir wines towards the end of 2017 or the start of 2018 – time will tell. Rest assured that our loyal mailing list members will be given prior notice of their release and first opportunity to order! If you’re not a mailing list member, make sure you join up. We are excited to announce three new releases! Joining the Bream Creek family are the new vintages of our Chardonnay (2012), Pinot Rosé (2015) and our very rare Germanic varietal Schönburger (2015). The Chardonnay has already been well received with 96 points from Wine Showcase (July 2015) as well as 5 stars and equal top of category in the recent Winestate Magazine Tasmania tasting (July/August 2015). The Rosé is a lovely salmon blush in colour, with strawberries and cranberries on the nose and palate. Finally, the Schönburger – we are very pleased with this wine, in fact we think it is the best vintage of this rare German grape we have ever made! There are lovely rose petal and melon notes on the nose, with a rich but balanced palate full of guava and pineapple flavours – regrettably stock is very limited. All three wines are now available through our online store! New Releases – Riesling and Cabernet Merlot! We have released the new vintages of our Riesling (2014) and our Cabernet Merlot (2012). Both have already been well received – the Riesling has received 94 points from both James Halliday and Wine Showcase Magazine as well as being awarded 4.5 stars and equal top of category in a recent Winestate tasting (placing it in the running for Winestate’s Wine of the Year), while the Cabernet Merlot has received 4 stars from Winestate Magazine and 90 points from Wine Showcase Magazine.